The purpose of this example is to illustrate how Nengo DL can be used to optimize a more complex cognitive model, involving the retrieval of information from highly structured semantic pointers. We will create a network that takes a collection of information as input (encoded using semantic pointers), and train it to retrieve some specific element from that collection. The goal of the system is then to retrieve a cued piece of information from the semantic pointer. For example, if we gave the network the trace \(DOG\) and the cue \(COLOUR\) it should output \(BROWN\). That is, convolving the trace with inverse of the given cue will produce (approximately) the associated filler. More details about the mathematics of how/why this works can be found here. We can create a model to perform this calculation by using the nengo.networks.CircularConvolution network that comes with Nengo. In order to assess the retrieval accuracy of the model we need a metric for success. In this case we’ll say that a cue has been successfully retrieved if the output vector is more similar to the correct filler vector than it is to any of the other vectors in the vocabulary. Now we can run the model on some test data to check the baseline retrieval accuracy. Since we used only a small number of neurons in the circular convolution network, we should expect mediocre results. These results indicate that the model is only rarely performing accurate retrieval, which means that this network is not very capable of manipulating structured semantic pointers in a useful way. 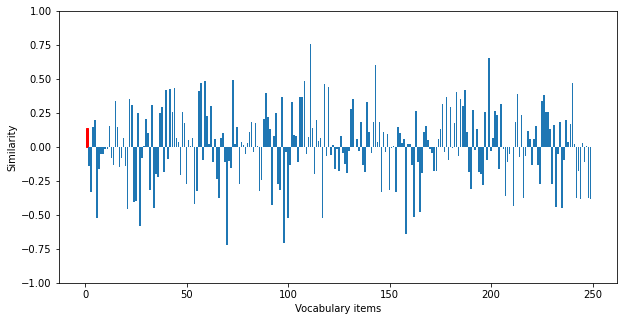 We can visualize the similarity of the output for one of the traces to get a sense of what this accuracy looks like (the similarity to the correct output is shown in red). 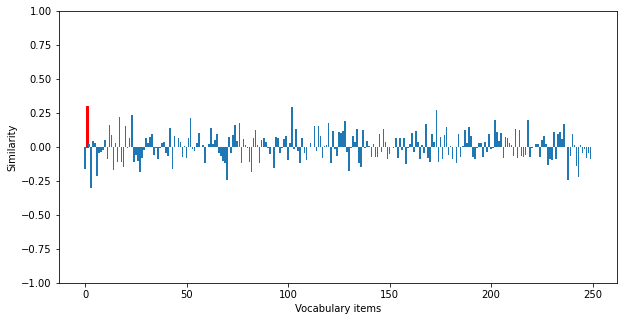 We can see that the actual output is not particularly similar to this desired output, which illustrates that the model is not performing accurate retrieval. Now we’ll train the network parameters to improve performance. We won’t directly optimize retrieval accuracy, but will instead minimize the mean squared error between the model’s output vectors and the vectors corresponding to the correct output items for each input cue. We’ll use a large number of training examples that are distinct from our test data, so as to avoid explicitly fitting the model parameters to the test items. To make this example run a bit quicker we’ll download some pretrained model parameters by default. Set do_training=True to train the model yourself. We can now recompute the network outputs using the trained model on the test data. We can see that the retrieval accuracy is significantly improved. You can modify the dimensionality of the vectors and the number of bound pairs in each trace to explore how these variables influence the upper bound on retrieval accuracy. Check out this example for a more complicated version of this task/model, in which a structured semantic pointer is built up over time by binding together sequentially presented input items.